It is often assumed that domestic animals in early urban Near Eastern centres either are a reflection of the local pastoral economy, or were raised at a distance by pastoral specialists. 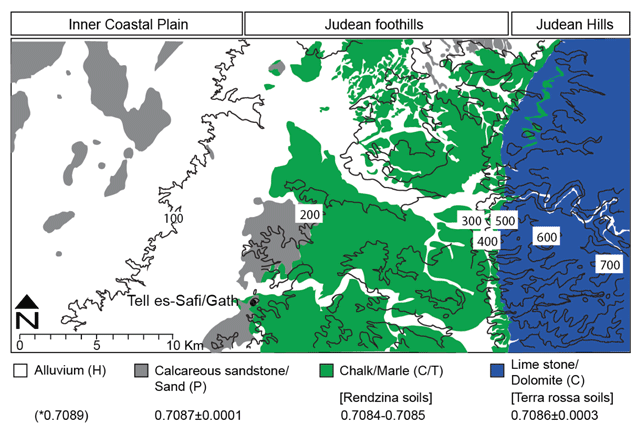 In this paper, we test these assumptions through detailed isotopic analyses (carbon, oxygen and strontium) of caprines (sheep and goat) from Tell es-Safi/Gath, an Early Bronze Age urban centre in central Israel. The isotopic analyses demonstrate that the bulk of the caprines were raised within the general vicinity of the site, suggesting that the majority of food resources were largely produced at the local level, within the territory of the city-state, and not at a distance by specialised pastoralists. It is the rare specimen that comes from a great distance and would have entered the local system through long distance trade networks. This study uses radiogenic strontium and stable carbon and oxygen isotope analyses to examine herd management strategies in the later Early Bronze Age (EB) III (c. 2850–2600 BCE) neighbourhood at Tell es-Safi/Gath in Israel. During this period, Tell es-Safi/Gath was one of the major urban centres of the region, dominating its own local territory and competing for influence, resources and power with other sites in the region (e.g. Shai et al. 2014; Shai et al. 2016a). The provisioning of food to early cities is a fundamental component of investigating past urban economies. However, very little attention has been given to the movement of animal resources from hinterlands to urban centres (Smith 2004) and there is little agreement in the literature about the nature of animal product provisioning in the earliest cities. The various archaeological models of animal product provisioning proposed for early cities range from generalised to specialised provisioning (Maltby 1985; Wapnish and Hesse 1988; Wattenmaker 1987a, b; and specifically, Zeder 1988, 1991). Further, Crabtree’s (1990) discussion of the examination of provisioning systems between urban and rural areas highlights the need to examine both the urban (consumer) and the rural (producer) sites for complementary patterns. In addition, none of these studies use animal based isotopic data in order to outline models of mobility for understanding management strategies in provisioning cities with food. While a variety of sources and/or producer sites may supply any urban centre, it is not always possible to collect the relevant data if excavations are not focused on the recovery of assemblages from both producer and consumer areas. In addition, any analysis must allow for the possibility of a variety of sources and/or producer sites/groups to provision an urban centre. As Wapnish and Hesse (1988) note, it is difficult to evaluate both the emergence of producing economies and consumption economies if one is examining only one site. However, with the introduction of the isotopic analyses of the domestic animals that would have been involved in this mobility, we overcome some of these limitations. To examine the nature of the animal mobility and the urban economy, it is necessary to determine where the animals are coming from, how the landscape is utilised, the nature of trade patterns, and how are animals distributed within an urban setting. Stable isotope analyses can determine the diet of animals (DeNiro and Epstein 1978, 1981), reconstruct environments (Schoeninger et al. 2000) including those that have been impacted by humans (i.e. foddering – Makarewicz and Tuross 2006), secondary products exploitation (Balasse et al. 2001) and herd management (Arnold et al. 2013; Balasse et al. 2003; Henton et al. 2010), in addition to mobility, trade and exchange of animals within the local economic system and the region (Ezzo et al. 1997; Grupe et al. 1997; Hodell et al. 2004; Hoppe et al. 1999; Price et al. 1994a, b, 2000, 2002). These economic strategies are controlled by humans, the herders/producers of these animals. Each of these factors is a key characteristic of the pastoral economy that when investigated will inform our understanding of the prehistoric animal production systems within the early urban context. 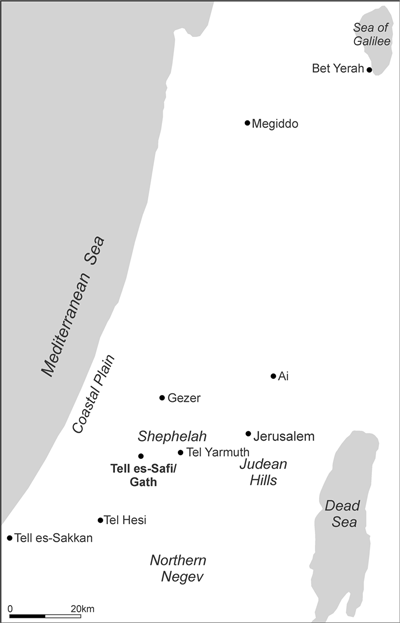 Tell es-Safi/Gath (Figure 1) is located at the western edge of the Shephelah (Judean foothills) and overlooks the southern coastal plain of Israel (Maeir 2008, 2012, 2013). It was occupied from the Chalcolithic (4th mill BCE) through to the 20th century CE almost without interruption. During the EB III, it was one of the paramount (fortified urban centres) sites in the regional settlement system across the southern Levantine landscape. Excavations at the site have demonstrated that the EB settlement existed across the entire “upper mound” (c. 24 ha in area) at the site and was surrounded by a major fortification system with a thick stone foundation (Figure 2). Map of region showing location of Tell es-Safi/Gath, and other relevant EB sites, regions and features in the Southern Levant. 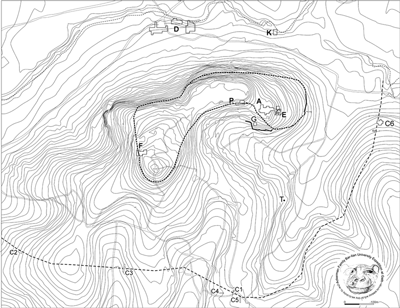 Map of site showing excavation areas and extent of EB fortifications. At the eastern end of the site, excavations have uncovered the remains of a substantive EB III domestic neighbourhood. All the material remains within this stratum appear to be related to domestic household consumption of food and other goods. The zooarchaeological remains used in this isotopic analysis derive from this neighbourhood (Stratum E5) (Greenfield et al. 2014) that was continuously occupied over a 250-year period (c. 2850–2600 BCE), based on stratigraphic analysis and the pottery assemblage (Table 1). In addition, most of the remains analysed here derive from the last phase of occupation before it was abandoned and destroyed (Stratum E5a). Contextual and excavation data of caprines. Seventeen animals were analysed and 16 are presented in this paper (15 caprines and one gazelle) for their dental isotopes. One individual sheep (OC#12) was subsequently dated to the Late Bronze period and is not considered in this analysis. The caprines were identified as eight sheep, six goats and a single indeterminate caprine based on a variety of morphological features. Sheep and goat remains are often lumped together in zooarchaeological investigations because it is difficult to reliably distinguish between the two species (e.g. Boessneck 1969). This is a historic limitation for all analysts that attempt to distinguish sheep from goats in archaeological assemblages. As the focus here is on teeth, publications on taxonomic tooth distinctions were extremely useful (Payne 1985; Halstead et al. 2002; Balasse and Ambrose 2005; Zeder and Pilaar 2010). A single wild animal, identified as gazelle (Gazella gazella) is included for comparative purposes between wild and domestic ungulates in the region. (Table 1, Figure 2). Gazelles are highly territorial animals and have a limited home range (Baharav 1981; Mendelssohn et al. 1995; Martin 2000) and it is hypothesized that gazelle would display a more restricted isotopic variability than mobile domestic herds under the control of herders. At the same time, goats and gazelles share some similar feeding patterns, as both are flexible mixed feeders that consume more browse or graze depending on seasonal availability of vegetation (Martin 2000). To prepare teeth for analysis, the tooth enamel surface is cleaned and a series of horizontal 1 mm wide bands are drilled from bottom to top and parallel to the growth and mineralisation axes of the tooth at 1.0 mm intervals following the methods outlined by Bocherens et al. (2001). Pretreatment of samples followed the methods of Balasse (2002). Tooth enamel is treated with a 0.5% sodium hypochlorite (NaOCl) solution overnight to remove organics and then rinsed five times with distilled water and treated with 0.1M acetic acid (CH3COOH, pH3) for four hours to remove diagenetic carbonates. The samples are then rinsed five times with distilled water and freeze-dried. The number of samples taken from each tooth varied depending on the size of the tooth. Even numbers samples were analyzed for strontium and odd numbered samples were analysed for carbon and oxygen. Carbon and oxygen isotopic analyses were performed at the Anthropology Department Stable Isotope Laboratory and Mass Spectrometry Laboratory of the University of Illinois Urbana-Champaign where ~700 μg of the prepared sample were weighed into individual vessels and reacted with 100% phosphoric acid (H3PO4) at 70°C in an automated Kiel III carbonate device in which CO2 is liberated from enamel, cryogenically distilled, and subsequently flow to a Finnigan MAT 252 isotopic ratio mass spectrometer. Analytical precision is typically ±0.07‰ for δ13C and ±0.14‰ for δ18O. Strontium isotope measurements were performed on a Nu Plasma HR multi-collector inductively-coupled plasma mass spectrometer (MC-ICP-MS) at the University of Illinois, Urbana-Champaign, Geology Department. Tooth enamel samples (pretreated followed the methods of Balasse 2002 discussed above) were dissolved in 0.5 ml of 3 N nitric acid (HNO3) under clean lab conditions. Cation exchange columns loaded with Eichrom® Sr spec resin and pre-conditioned with 3 N HNO3 were prepared and the 0.5 ml samples loaded. Column blanks consisted of 0.5 ml of 3 N HNO3. Columns were washed four times with 0.3 ml of 3 N HNO3 and then strontium was eluted into 4 ml Teflon® vials with 1 ml of 0.05 N HNO3 and 3 ml of ultrapure deionized water (Milli-Q, Millipore) following Horwitz et al. (1992). Linear normalisation of sample results was applied based on within-run trends in SRM 987 relative to its accepted value (0.710255). Analytical precision on repeated standard measurements was ±0.00003. Three types of isotope analyses were conducted. The results of each are described next. For summary of the results see Table 2 and Figures 3, 4, 5. 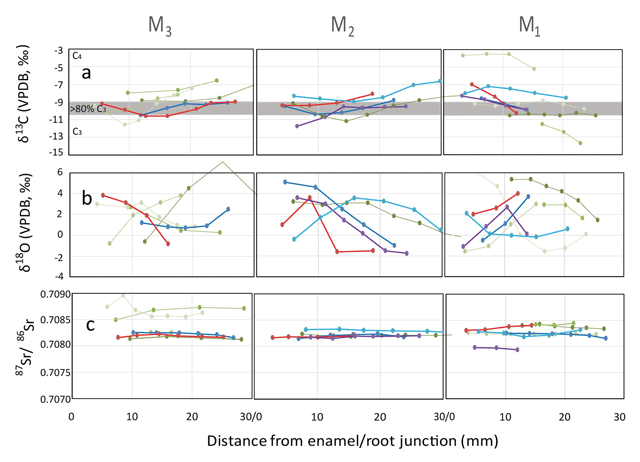 Caprine tooth enamel sequential isotope data from EB Tell es-Safi/Gath: a) δ13C values (gray band represent 80% contribution of C3 vegetation to diet); b) δ18O values; c)87Sr/86Sr ratios); M3–M1 are third to first mandibular molars. Teeth that were recovered intact in mandibles, were color coded as following: OC#9 red, OC#7 dark blue, OC#16 light blue, OC#11 purple. Remaining isolated teeth are marked in shades of green. Gazelle tooth enamel sequential isotope data from EB Tell es-Safi/Gath: a) δ13C values; b) δ18O values; c)87Sr/86Sr ratios (gray dashed line and band represent mean and standard deviation of Tell es Safi/Gath caprines respectively). Map showing the regional elevations (masl) and bioavailable 87Sr/86Sr ratio isoscape of the Tell es-Safi/Gath region, based on local geological maps (modified from Arnold et al. 2016). Carbon isotope values indicate that the caprine diets contained predominantly C3 vegetation that dominates the Mediterranean climate. However, minor contribution of C4 vegetation is evident in most individuals (Figure 3a). The relative contribution of C3 vs. C4 is modified after Hartman (2012) where 100% wet (–14.1‰) and dry (–12‰) season C3 values are based on the most negative seasonal M1 record of OC #4. 100% C4 contribution (+4‰) is based on the +14‰ fractionation factor (ɛ) between average C4 vegetation and ruminants carbonate δ13C values (Passey et al. 2005). OC #3, a goat, clearly stands out with a predominantly C4 signature. It was previously identified as having spent its early years in the Nile Valley of Egypt (Table 2) (Arnold et al. 2016). OC #13, a sheep, is notable for ~50% C4 contribution to its diet. However, while both the oxygen and the strontium data for OC#3 support a foreign origin, these isotopes for OC#13 plot locally for both strontium and oxygen (Table 2) (discussed below). The seasonal patterns emerging from the analysis of M1–M3 teeth are quite uniform (Figure 3a). The M1 formation shows gradual transition to positive δ13C values, while M2 and M3 vary uniformly concavely with negative values during mid-tooth crown formation and positive values during early and late tooth formation. Those likely represent two consecutive years, which is a pattern of tooth formation that is known in modern caprines (Greenfield and Arnold 2008). The inter-teeth range of M1 δ13C values is notably wider than that of than seen in the M2 and M3 teeth. This indicates that the birthing and early juvenile life of the caprine took place in various herds that were foraged in diverse habitats. The carbon isotopes from the gazelle show an exclusive C3 diet (Figure 4). Both goats and gazelles are flexible browsers that may eat variable proportions of browse or graze according to the season. Unlike caprine, gazelles are not obligatory drinkers, as such they feed exclusively on green vegetation (Mendelssohn et al. 1995). During the wet season (late Autumn to early Spring), they graze on herbaceous vegetation. They shift to browsing of ligneous vegetation leaves in the dry season (late Spring-early Autumn – Baharav 1981; Martin 2000). In addition, gazelles are highly territorial animals that will feed from a limited geographic area as they occupy relatively small home ranges varying in size from 0.5 km2 to 5 km2, depending mostly on plant biomass productivity (Martin 2000; Yom-Tov et al. 1995). The seasonal oxygen isotope pattern that emerges from the analyses of caprine teeth (M1–M3) provides important insights on their origins and water management. First the mostly negative δ18O values in each of the teeth groups indicate a uniform wet season environmental signal that varies between 0–(–2) ‰ (n = 13, (Figure 3b). Those are comparable to prehistoric gazelles originating in low topographies of the eastern Galilee and much higher than the negative values measured in high topography gazelles (Hartman et al. 2015). This pattern helps determine that the EB caprines were herded eastwards from the site to the lower reaches of the Judean Mountains. Even though the Judean Mountains elevation reaches ~1000 m above modern sea level, there is no indication that they were herded into the higher reaches of the Judean Mountains since their isotopic values are comparable to the gazelle’s low topographies values. In addition, there is a pattern of seasonal increase in δ18O values that is associated with a dry season evaporative environment. The average difference between wet and dry seasons in different specimens is pronounced – x̄ = 4.7 ± 2.2‰ (Figure 2b). Subsequently, these results indicate that herds consumed dry season green vegetation and were not heavily dependent on water supply from isotopically stable ground water sources (i.e. water cisterns, wells). Finally, while seasonal oxygen isotope value oscillations are not uniform for the various caprine specimens (Figure 3b), the amplitudes correspond to differences between wet and dry values. This lack of uniformity is resolvable by wiggle matching of certain specimens (i.e. OC#14 M1, OC#16 M2+M1, and OC#6 M3). Minor differences in birthing timing (early vs. late season) or tooth formation can more fully explain these mismatched oscillations. Several environmental factors affect the bioavailable strontium in any region, including the underlying rock, the rate and extent of rock weathering, soil drainage, pH, aeolian dust, and rainwater transport (Capo et al. 1998; Naiman et al. 2000; Montgomery et al. 2010). Therefore, migration studies must utilise strontium isotope ratios of bioavailable strontium (i.e. vegetation), rather than solely of substrate geology to construct a local and regional isoscape. Local sampling of plants surrounding the site of Tell es-Safi/Gath provides verification to bioavailable 87Sr/86Sr ratios (Hartman and Richards 2014) which is discussed in Arnold et al. (2016). The range of 87Sr/86Sr ratios measured in most of the specimen fits the bioavailable sources ranging from the Mediterranean Sea coastline (OC#1 M3, 0.7090) in the west to the terra rossa soils of Judean foothills east of the site (0.7085–0.7087) (Table 2 and Figure 5). Even though the landscape further eastward, is still dominated by terra rossa soils, herding would be constrained by the wet season δ18O values that indicate low elevation foraging. The single gazelle specimen available for this study falls within the plot distribution associated with rendzina soils that form immediately east of Tell es-Safi/Gath (0.7083). The gazelle’s uniform range of 87Sr/86Sr ratios (Figure 4c) is overlapped by many of the caprines, and provides further evidence for the locale of herding activities that formed part of the site’s economy. Several researchers (Hesse 1986; Hesse and Wapnish 2002; Stein 1987; Zeder 1988, 1991) suggest a key element of developing specialised economies in early urban centres is whether animals were distributed through a direct or an indirect provisioning system. In a direct provisioning system, the inhabitants are producers and/or have close, direct ties to subsistence production. In an indirect provisioning pattern, the inhabitants are not involved in production and are consumers that must acquire their animal resources from pastoralists – those that keep herds (Zeder 1991). Marom et al. (2009) argue that the pastoral component of the economic system was separate from the agricultural component as a common feature throughout the Near East. It is suggested that sheep and goats were managed by many small holders and that animals ranged extensively for adequate pasture and at a distance from the settlement in order to reduce impact on agricultural production during the growing season (Hesse 1986; Köhler-Rollefson 1992; Redding 1981). This spatial separation of pastoralists and their animals from the settlement has been suggested by some (e.g. Köhler-Rollefson 1988; Rollefson and Köhler-Rollefson 1993) to date back to the Pre-Pottery Neolithic (8500–5500 BCE). Others (e.g. Lees and Bates 1974) argue that it is a product of the emergence of the social stratification, a key element of the rise of urbanism and early state level societies. In fact, Zeder (1988, 1994, 2009) warns against trying to pigeon hole provisioning strategies into rigid models but rather it is imperative to intensively investigate and embrace the flexibility and individualised responses cities have to the particular demands of feeding their populations before trying to fit them into a preconceived mold. The isotope results from EB Tell es-Safi/Gath indicate a local grazing pattern of caprines on soils that cover an expansive region found on the hills of the Shephelah to the east of and bordering on Tell es-Safi/Gath. This hilly region is very suitable for the herding of both grazers (sheep) and browsers (goats). This geographic range likely represent a single economic territory where a number of different herds were grazed, some of which at a slightly greater distance beyond a daily walking distance from the site suggesting a direct provisioning system to the city as herds are kept within a close proximity. The δ18O values of the caprines further suggests variability in pasture locations by different herds or producers. This variability may be the result of chronological variability over the 250-year period of EB occupation at the site perhaps the result of areas for grazing shifting to allow zones to recover or grazing areas being chosen based on trade routes. However, there is no evidence to suggest that the urban centre was being provisioned by livestock from such a great distance and not under the direct control of the city’s inhabitants. Livestock was herded across territory of the city, but not far in proximity from its centre of control. Given the geographic proximity of competing EB urban centres at the eastern edge of the Shephelah and base of the Judean Mountains (e.g. Azekah, Yarmouth – Miroschedji 2009; Lipschits et al. 2017), the isotope data can be interpreted to suggest the existence of a largely direct and predominantly local provisioning system since the influence of the urban centre would have been felt throughout its territory. The variation seen in the δ13C values reflects the large range of values measured in local C3 vegetation (δ13C site means: –29–(–25)‰), after correction to post-industrial atmospheric 13CO2, and to the response of different plant life to seasonal and annual availability of water (Escudero et al. 2008; Hartman and Danin 2010). The local provisioning of the urban centres appears to persist in the broader region for an extended period. For example, during the Hellenistic period (400–200 BCE), stable carbon and nitrogen isotope analysis of bone collagen demonstrate that all domestic animals (cattle, sheep, goats and pigs) from Düzen Tepe in southwestern Turkey were herded in the same general area and fed similar foods, suggesting the presence of a local and direct provisioning system (Fuller et al. 2012). Archaeological, zooarchaeological and trace element data from Sagalassos, Turkey are used to argue that the city was provisioned by herds in the local vicinity through the Early and Middle Imperial periods (c. 25 BCE–300 CE) (Vanhaverbeke et al. 2011). Pearson et al. (2007) note the lack of isotopic distinction between the diets of sheep and goats at their Neolithic sites. The same pattern is present in the caprine sample from Tell es-Safi/Gath. These data suggest a generalised livestock production system since the lack of variation in isotopic values between the two species of caprines (sheep and goats) would allow one to argue against specialised production. Sheep and goats are traditionally exploited for different products (i.e. meat, milk, wool) and are often expected to have different management patterns as a result. In the primary zooarchaeological analyses from EB Tell es-Safi/Gath (Greenfield et al. 2016), there are several clear distinctions between sheep and goat. First, goats are the more common species (13%), almost double in frequency than sheep (7% of the total assemblage). While this is in contrast to many contemporary EB III sites in the region, where sheep are more common than goats, the relative frequency of sheep and goat is highly variable due to site size and environmental setting (Lev-Tov et al. 2011; Sasson 2010). In addition, the primary zooarchaeological analysis reveals that goats are being managed quite differently than sheep at the site. Approximately 50% of goats are being slaughtered as adults, while only 23% of sheep are killed at this age. These mortality patterns indicate that goats were being exploited heavily for secondary products, such as milk, while sheep were primarily exploited for meat (Greenfield 2010; Greenfield et al. 2016; Vila and Helmer 2014). As such, the primary zooarchaeological analysis allow us to argue in favour of specialised production of goats for milk. This zooarchaeological age-at-death data for goats might allow us to argue for productive specialisation of milk production at Tell es-Safi/Gath during the EB III with goats (Greenfield et al. 2016). However, if milk is a key product for consumption at the site, dairy herds would need to be maintained in relatively close proximity to the site (cf. Wapnish and Hesse 1988). Milk is not well suited to an indirect system of distribution (Zeder 1991). The isotopic data both support the idea of local herding since the herds are not being brought up into the high mountains as in transhumance. On the other hand, the isotopic data do not support herding of all livestock in immediate proximity of the site since there are indications that the herding of some individuals extends beyond a single day’s easy back-and-forth walking distance from the site. In addition, the lack of isotopic variation between sheep and goat argues against the presence of specialised and separate meat and dairy herds on the landscape. Specialised economies can serve as a means of regional integration (Zeder 1991; Wapnish and Hesse 1988). The export or import of domestic stock can be used as evidence of increasing economic specialization since a network of exchange would be necessary to integrate communities that specialize in production (Wapnish and Hesse 1988). The presence of non-local animals in the Tell es-Safi/Gath sample indicates that a small percentage of animals were brought to the site from regions much further afield, including as far away as Egypt (Arnold et al. 2016; Shai et al. 2016b). For example, the strontium ratios from the first molar of OC#11 indicate that it was born elsewhere. Based on its lower 87Sr/86Sr (0.70794–0.70798) (Table 2), these ratios suggest a more arid environment of birth (soft bedrock Sr ratios). The combined contribution of soft bed rock weathering and atmospheric deposition in rendzina soils who develop locally on Paleogene marine sedimentary bedrock is correlated with mean annual precipitation. In arid regions, the contribution of bedrock weathering increases and 87Sr/86Sr become less radiogenic (Hartman and Richards, 2014). However, this is not reflected in either the carbon or oxygen values. The strontium ratios from the second molar of OC#11 clearly indicate that it moved into the local Tell es-Safi/Gath region during the formation of this tooth (in caprines, during the first year of life – Hillson 2005). In addition, OC#13 has a strong C4 signature that is distinct from the other samples. This suggests a foreign origin for this specimen, but without corresponding oxygen or strontium isotope data that would indicate its foreign origin. This evidence for the import of domestic animals fits with other evidence that EB Tell es-Safi/Gath had a role in inter-regional trade during the EB III (e.g. Shai et al. 2016b; Beller et al. 2016). However, the foreign source for animals is minimal and insufficient to argue for specialized interregional herd production system for urban provisioning during this time period. While it is often lamented that economic specialisation is difficult to identify in the archaeological record of early cities (Maltby 1985; Miller et al 2009; Wapnish and Hesse 1988; Wattenmaker 1987a, b; Zeder 1988, 1991; Smith 2004), the isotopic analyses presented here offer some new insights to this question with respect to food provisioning. The isotopic data from the Early Bronze III horizon at Tell es-Safi/Gath suggests the existence of a variety of caprine herds grazed across the landscape, but largely within the territory of this early urban centre. These herds formed part of a local and generalized pastoral economy system that provisioned the urban centre with animal products. Caprines were predominantly raised together (goats and sheep) in the same herds and not at a great distance from the site. Given the isotopic variability, it is clear that Tell es-Safi/Gath was supplied with sheep and goats from a variety of herders that are moving herds across the region surrounding the site. This is reflected by the mixed diet and variability among the herders providing animal resources to the site. Arnold, E R, Hartman, G, Greenfield, H J, Shai, I, Babcock, L and Maeir, A M 2016 Isotopic evidence for early trade in animals between Old Kingdom Egypt and Canaan. PLOS One, 11(1–12): e0157650. Baharav, D 1981 Food habits of the mountain gazelle in semi-arid habitats of eastern Lower Galilee, Israel. Journal of Arid Environments, 4(1): 63–69. Bocherens, H, Mashkour, M, Billiou, D, Pellé, E and Mariotti, A 2001 A new approach to studying prehistoric herd management in arid areas: intra-tooth isotopic analysis of archaeological caprine from Iran. Comptes Rendus de l’Académie des Sciences Paris, Sciences de la Terre et des Planètes, 332: 67–74. Boessneck, J 1969 Osteological differences between sheep (Ovis aries Linné) and goat (Capra hircus Linné). In: Brothwell, D and Higgs, E S (eds. ), Science in Archaeology, 331–359. 2nd edition. Thames and Hudson, London. Crabtree, P J 1990 Zooarchaeology and complex societies: some uses of faunal analysis for the study of trade, social status, and ethnicity. Archaeological Method and Theory, 2: 155–205. de Miroschedji, P 2009 Rise and collapse in the southern Levant in the Early Bronze Age. Scienze dell’antichità. Storia Archeologia Antropologia, 15: 101–129. Greenfield, H J, Brown, A, Shai, I and Maeir, A M 2016 Preliminary analysis of the fauna from the Early Bronze Age III neighbourhood at Tell es-Safi/Gath. In: Bones and Identity: Zooarchaeological Approaches to Reconstructing Social and Cultural Landscapes in Southwest Asia (Proceedings of the ICAZ-SW Asia Conference, Haifa), Marom, N, Yeshurun, R, Weissbrod, L and Bar-Oz, G (eds. ), 170–192. Oxbow Press, Oxford. Greenfield, H J, Shai, I and Maeir, A M 2014 Understanding Early Bronze Age urban patterns from the perspective of non-elite neighbourhood: the excavations at Tell es-Safi/Gath, Israel. Proceedings of 9th International Congress on the Archaeology of the Ancient Near East, (June 9–13: 2014, Basel), Reports, Stucky, R A, Kaelin, O and Mathys, H P (eds. ), 3: 1537–1551. Harrassowitz Verlag, Wiesbaden. Hesse, B and Wapnish, P 2002 An archaeozoological perspective on the cultural use of mammals in the Levant: an overview. In: de Miroschedji, P (ed. ), L’urbanisation de la Pelestine à l’âge du Bronze ancient British Archaeological Reports, International Series 527, 279–296. Oxford: BAR. Köhler-Rollefson, I 1992 A model for the development of nomadic pastoralism on the Transjordanian Plateau. In: Bar-Yosef, O and Khazanov, A (eds. ), Pastoralism in the Levant: Archaeological Materials in Anthropological Perspectives, 11–18. Monographs in World Archaeology 10. Madison, WI: Prehistory. Lipschits, O, Gadot, Y and Oeming, M 2017 Four Seasons of Excavations at Tel Azekah: The Expected and (Especially) Unexpected Results. In: The Shephelah during the Iron Age: Recent Archaeological Studies, Lipschits, O and Maeir, A M (eds. ), 1–25. Winona Lake, IN: Eisenbrauns. Maeir, A M 2008 Zafit, Tel. In: The New Encyclopedia of Archaeological Excavations in the Holy Land 5: Supplementary Volume, Stern, E (ed. ), 2079–2081. Jerusalem: Israel Exploration Society. Maeir, A M 2012 Tell es-Safi/Gath I: The 1996–2005 Seasons. Ägypten und Altes Testament 69. Harrassowitz, Weisbaden. Maeir, A M 2013 Gath. In: The Oxford Encyclopedia of the Bible and Archaeology, Master, D M (ed. ), 443–451. New York. Maltby, J M 1985 Patterns in faunal assemblages variability. In: Barker, G and Gamble, C (eds. ), Beyond Domestication in Prehistoric Europe. Investigations in Subsistence Archaeology and Social Complexity, 33–74. London: Academic Press. Marom, N, Mazar, A, Raban-Gerstel, N and Bar-Oz, G 2009 Backbone of society: evidence for social and economic status of the Iron Age population of Tel Rehov, Beth Shean Valley, Israel. Bulletin of the American Schools of Oriental Research, 354: 55–75. Mendelssohn, H, Yom-Tov, Y and Groves, C P 1995 Gazella gazella. Mammalian Species, 490: 1–7. Redding, R 1981 Decision Making in Subsistence Herding of Sheep and Goats in the Middle East. Unpublished PhD Thesis. Ann Arbor: University of Michigan. Sasson, A 2010 Animal Husbandry in Ancient Israel: A Zooarchaeological Perspective on Livestock Exploitation, Herd Management and Economic Strategies. Approaches to Anthropological Archaeology. Equinox Publishers, London. 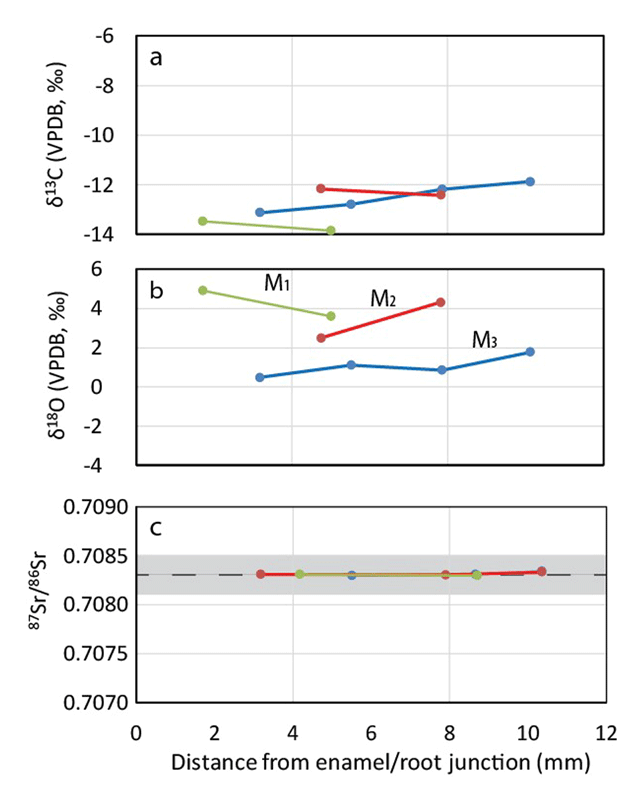 Schoeninger, M J, Kohn, M J and Valley, J W 2000 Tooth oxygen isotope ratios as paleoclimate monitors in arid ecosystems. In: Ambrose, S H, Katzenberg, M A (eds. ), Biogeochemical Approaches to Palaeodietary Analysis Advances in Archaeological and Museum Science, 5: 117–140. New York: Kluwer Academic/Plenum Publishers. Shai, I, Greenfield, H J, Brown, A, Albaz, S and Maeir, A M 2016b The importance of the donkey as a pack animal in the Early Bronze Age Southern Levant: A view from Tell es-Safi/Gath. Zeitschrift Des Deutschen Palästina Vereins, 132(1): 1–25. Shai, I, Greenfield, H J, Regev, J, Boaretto, E, Eliyahu-Behar, A and Maeir, A M 2014 The Early Bronze Age Remains at Tell es-Sāfi/Gath: An Interim Report. Tel Aviv, 41(1): 20–49. Vanhaverbeke, H, DeGryse, P, De Cupere, B, Van Neer, W, Waelkens, M and Muchez, P 2011 Urban-rural integration at ancient Sagalassos (SW Turkey). Archaeological, archaeozoological and geochemical evidence. Archaeofauna, 20: 73–83. Vila, E and Helmer, D 2014 The expansion of sheep herding and the development of wool production in the ancient Near East: an archaeozoological and iconographical approach. In: Breniquet, C and Michel, C (eds. ), Wool Economy in the Ancient Near East and the Aegean: From the Beginnings of Sheep Husbandry to Institutional Textile Industry, 22–40. Oxbow: Oxford. Wattenmaker, P 1987b The organization of production and consumption in a complex society: A study of a village site in southeast Turkey. MASCA Journal, 4(4): 191–203. Zeder, M A 1988 Understanding urban process through the study of specialized subsistence economy in the Near East. Journal of Anthropological Archaeology, 7(1): 1–55. Zeder, M A 1991 Feeding Cities: Specialized Animal Economy in the Ancient Near East. Washington: Smithsonian Institution Press. Zeder, M A 1994 After the Revolution: Post-Neolithic Subsistence in Northern Mesopotamia. American Anthropologist, 96(1): 97–126. New Series.